Why We in FNE Choose to Receive Communion on the Tongue | Federation of North-American Explorers | Semper Parati! Editor’s Note: Of course we in FNE respect the traditions of all ritual Churches in communion with the Holy See, and receive Holy Communion standing when attending the Liturgies of those Churches where standing is traditional. What follows pertains to the Latin (or Roman) Church to which the majority of FNE Explorers belong. FNE is proudly and uniquely a Catholic faith-based Christ-centred youth movement. Together we diligently work together to help our youth grow in their faith, to be more willing to love and serve the Lord all within the teachings of our faith. We help our youth discover, appreciate, and value the beauty of what God has made both within nature and amongst one another as people as part of our daily lives. We teach our youth to love and respect others regardless of creed, culture, or colour. 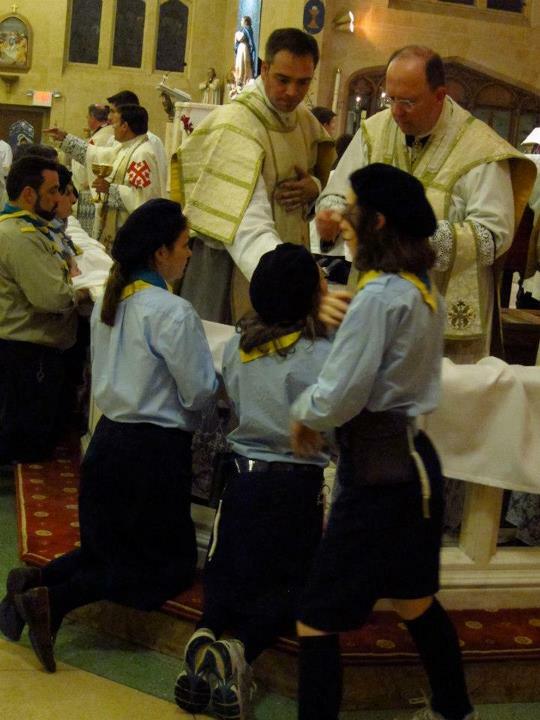 We strive to help our youth to better understand the awe, majesty and gift of the Eucharist that we can receive at Holy Mass, that this truly is the Body, Blood, Soul, and Divinity of Our Lord Jesus Christ, that it is Jesus in person Himself that we are about to receive bodily and spiritually. There is a statistic bandied about today that sixty percent or more of Catholics do not believe in the Real Presence of Christ in the Eucharist. One has to wonder, if this is correct, when the sense of awe and reverence for the Eucharist began to erode. Prior to Vatican II we all received the Blessed Sacrament on the tongue and in most Churches, if not all, while kneeling. After Vatican II, in an effort to “modernize” the Church, many churches removed the altar rails and with them, kneeling for Communion, and following that many bishops of the day asked for permission from the Holy See to distribute Communion ‘in the hand’ rather than ‘on the tongue.’ Pope Paul VI did not support this change and asked that the norm of receiving communion on the tongue while kneeling be continued as the Holy Father was concerned that such a change could result in the danger of loss of reverence towards the Blessed Sacrament, as well as the risk of profanation of the Sacred Host and of “adulterating” belief in the Real Presence of Christ in the Eucharist. In 2008, on the Feast of Corpus Christi, Benedict ordered that from that time forward the only proper method of receiving Communion at Papal Masses is to receive the host on the tongue and while kneeling. So why kneel at Mass rather than stand or sit as it is done within other Christian faith communities? How we pray does speak to what we believe, and how we act flows by what we believe. Kneeling before the Blessed Sacrament at the moments of consecration at Mass means adoration before our Lord and God. It means recognizing the Real Presence of Christ in the Eucharist; it means a sense of awe and an attitude of great faith of a person who prostrates before God because that person is thankful knowing that everything comes from God; we are in awe, we are speechless, we recognize God’s love and goodness and the wonder of his love. So it is within our FNE movement. We truly believe in the presence of our living Lord in every single Eucharistic host or crumb from a host that may have broken away while being handled. Frankly speaking our faith calls us to prostrate ourselves before God as we are his children and he is our creator, Lord and God. We do our best to help our youth discover, embrace and hold a sense of profound reverence and faith. We have also taken to heart the words from Pope St. John Paul II when he said: “There is an apostolic letter on the existence of a special valid permission for this [Communion in the hand] but I tell you that I am not in favour of this practice, nor do I recommend it.” (source) Furthermore the Vatican continues to promote Communion on the tongue both for its long tradition and because “it expresses the faithful’s reverence for the Eucharist” and “removes the danger of profanation of the sacred species.” (Memoriale Domini, 29 May 1969). Pope Emeritus Benedict and Pope Saint John Paul II both clearly supported Communion on the tongue and Pope Francis continues to carry on the Church tradition of Communion on the tongue at all Papal Masses. We embrace the teachings of our Holy Father as part of our daily lives and practices within our faith community. The moment of reception of our Blessed Lord in the Eucharist is a moment when we choose to adore Him rather than put ourselves on equal footing with Our Lord. Because this is a moment when the external signs of adoration – primarily receiving on the tongue and if possible, kneeling, are signs of correct interior disposition that we believe in the Real Presence of Christ in the consecrated species. Communion on the tongue promotes Christo-centrism — the fact that Christ is the centre and central to our Church. Communion on the tongue fosters increased respect for the Blessed Sacrament and helps prevent possible accidental abuses of the Sacred Species on the part of our members. So what do our members think about all this? From a 14 year-old Explorer: I love to receive Jesus in this way, if he stood before me in his human form I would fall to my knees in awe, respect and love. I believe that it is Jesus in the Eucharist …. That is why I receive him the way that I do. From a 9 year-old Timber Wolf: At school masses or even at my home parish I am often one of the few that receive Jesus in this way. That’s OK, my friends sometimes ask me why I receive Jesus in this way and when I tell them they say cool and some even now receive Jesus the same way that I do. From a Leader: Watching our youth as to how they receive Jesus in this way so happily, with awe, love, and respect really helped me appreciate how we choose to receive our Lord as encouraged by this and past Popes. 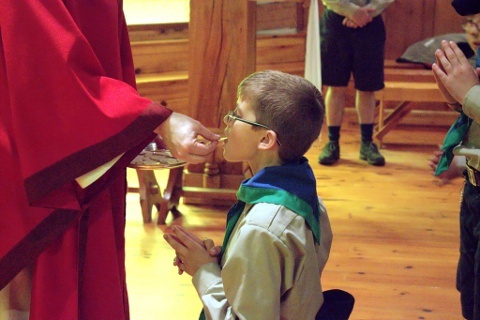 From a Parent: My son has grown to love attending Mass and most especially by receiving our Lord in this manner such that his reverence and belief in the real presence of our Lord in the Eucharist is amazing, strong and so joyful. Thank you! A special thanks to Deacon Paul Pettie as to his writings on this topic that shaped this story. Finally, although this is our preferred way to receive Our Lord in Holy Communion in FNE, we understand and respect that the people of the parish may choose to receive Our Lord standing and in their hands.